The saga continues with Super 10 Stars! A video slot machine loaded up with different mechanics and tripling the prize options. 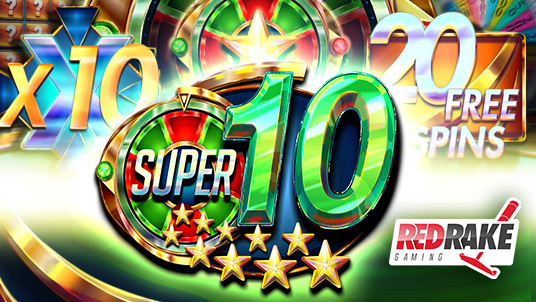 With all the excitement of Super 5 Stars and all the prize variety of Super 7 Stars, coming now to Red Rake Gaming is: Super 10 Stars. This new html5 video slot machine with 3x5 reels and 30 prize lines captures the player´s attention from the outset thanks to the excitement and range of prize options that the “Super 10 Stars” symbol offers. Pay attention to this symbol as it can provide multipliers, free spins, a new mini game and a succulent roulette wheel, perfect ingredients to make this new video slot machine one of the most exciting of the Super Stars saga on Red Rake Gaming. Innovation, improvement and careful attention to detail are once again evident in this new video slot machine by Red Rake Gaming.